Google's aggressive push into cloud computing, where it trails Amazon.com and Microsoft, has put the internet giant in the lead position to land a marquee client: PayPal. While Google is the front-runner, according to people familiar with the matter, PayPal is evaluating the other leading providers and hasn't made any final decisions. PayPal is unlikely to move its technology infrastructure in the fourth quarter, the peak period for online commerce, said the sources, who asked not to be named because the talks are confidential. Under the leadership of VMware co-founder Diane Greene, Google is out to prove that it's a legitimate player in the rapidly expanding cloud infrastructure market. It's a business that Amazon Web Services has come to dominate by opening up massive data centers across the globe and continuously adding new software tools that allow large corporations — and government entities — to securely offload their computing and storage needs. Since taking the helm nine months ago, Greene has been in hot pursuit of Google's rivals, and her team is getting particularly aggressive on price as a way to potentially lure some of the biggest enterprises, sources said. With close to $80 billion in cash and equivalents at the end of the second quarter and a $10 billion annual capital expenditure budget for parent Alphabet, Google has plenty of ammunition to engage in a pricing war. Representatives from Google and PayPal declined to comment, as did spokespersons from Amazon and Microsoft. PayPal would be a top-tier logo for a variety of reasons. It's a name with broad brand recognition and it's a Silicon Valley company that operates in the financial services sector. All the big banks are evaluating cloud vendors, and of primary concern is their ability to manage the regulatory burden around data protection. Mark Mahaney, an analyst at RBC Capital Markets in San Francisco, said in an interview last week on CNBC that cloud computing is "really kind of reaching these tipping points in large companies, including financial services firms [which] are really starting to embrace cloud computing." Additionally, PayPal is a massive technology company built in the pre-cloud era. Within its own data centers, the company processes $10,900 worth of payment volume per second and stores information on 188 million active accounts in over 200 markets. On the company's first-quarter earnings call in April, CEO Dan Schulman said, "We run one of the largest private cloud environments in the world." PayPal does have some existing business with AWS, namely its Braintree and Venmo products, which the company acquired in 2013 (when PayPal was still part of eBay). In moving infrastructure to the cloud, big companies often start with test and development workloads before touching critical customer information, and that's likely where PayPal will begin, sources said. No move to Google, AWS or Microsoft Azure would mean abandoning its own data centers and technology. After all, the company owned or leased 3.5 million square feet of space, including offices and data center facilities, as of the end of 2015. But cloud services would open up new technical capabilities that are difficult inside their existing infrastructure. For example, on Cyber Monday, when transaction volume is many times the daily average, PayPal could quickly spin up new servers to meet demand and not have to pay for a bunch of gear that sits idle the rest of the year. On Cyber Monday 2015, PayPal experienced a brief service interruption, an embarrassing and potentially costly gaffe. Google has been pumping money into its cloud technology as well as the sales, marketing and support needed to meet enterprise standards. CEO Sundar Pichai talked up Greene and the cloud unit on the company's second-quarter earnings call. "Diane has initiated a set of changes and essentially she has integrated our go-to-market strategy with our engineering and product efforts," Pichai said in July. "I see a shift to a world-class enterprise approach, and it's definitely having an impact on the type of conversations we are having and the outcome of the RFPs (requests for proposals) we are engaged in." Still, cost remains an important factor. Earlier this month, AWS dropped the price of a storage product by 47 percent, the 52nd time Amazon has slashed prices. Google has to be able to match or beat AWS in terms of speed and reliability while also winning on price against a company that's grown up thriving on razor-thin e-commerce margins. Greene addresses the market share gap by focusing on the long game that Google is playing in an industry that's still relatively nascent. AWS generated sales of $2.9 billion in the second quarter, almost six times the amount Google makes in an entire year, based on RBC's estimates. According to an Aug. 1 report from Synergy Research Group, Google's cloud revenue surged 162 percent in the second quarter from a year earlier, but the company still only commands 5 percent of the market. 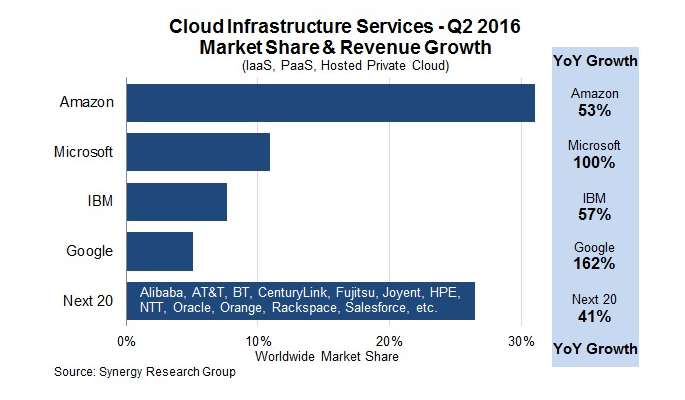 AWS leads at 31 percent, followed by Microsoft at 11 percent and IBM at 8 percent, Synergy said. Google's cloud has won praise for powering Snapchat and Spotify, and it recently picked up business from Home Depot and Walt Disney. Nabbing PayPal would represent another big step in its pursuits.